During a mid-October session of the city council, the city’s governing body approved the transfer of 10 taxi licenses from Yellow Car Taxi to Excellent Transportation by sidestepping its own ordinance that calls for certain specific conditions to be met prior to a transfer. In this case the onus was on Yellow Car Taxi of Cianci Street to advertise. No notice stating the company’s intention to transfer the licenses appeared in any newspaper, said Edgar Collazo, a city resident attempting to establish a taxi company. Minutes before the October 14th, 2014 vote, Collazo took to the podium, revealing irregularities with the transfer application. “I showed some of the council members what was going on, but they still went through with it,” said Collazo. Collazo also informed council members that the company that’s taking over the 10 licenses, in this case Excellent Transportation of Park Avenue, does not have Board of Adjustment approval to operate a taxi company, another condition that the company is required to meet prior to transfer: the ordinance calls for “appropriate variance or other relief… [be] obtained” prior to a transfer. 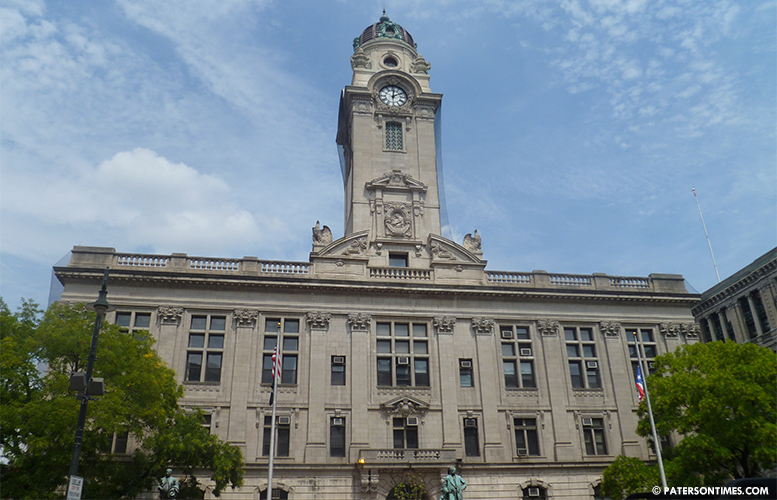 Collazo submitted a large number of Open Public Records Act requests in an effort to locate the proof of variance – the city did not have any on file. An ordinary certificate with Board of Adjustment approval. Excellent Transportation’s certificate devoid of when the Board of Adjustment granted approval. 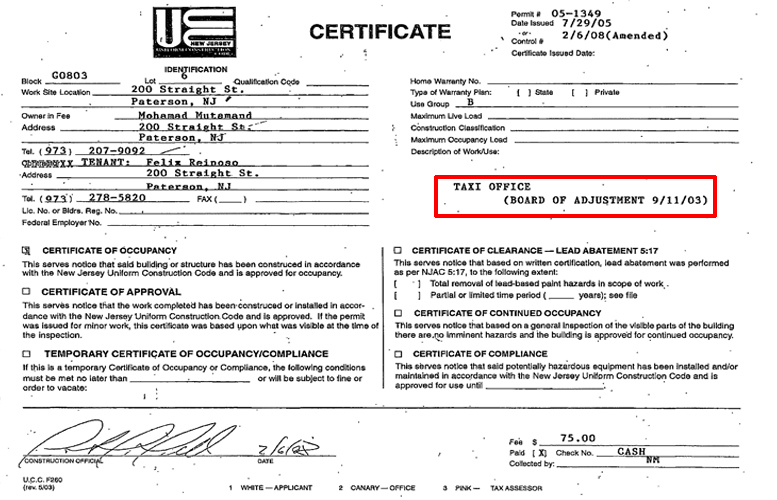 Collazo provided a city document that ordinarily would indicate the date of when the company obtained Board of Adjustment approval; however, the Park Avenue company has no such mark on its certificate of occupancy (CO). “Every company has a date on its CO [of] when it went before the zoning board,” said Collazo. He said before the council’s vote, the city’s Division of Planning and Zoning slapped on an administrative approval. When contacted for comments for this story, Michael Deutsch, director of the division, said he would look into the variance issue, and get back. Deutsch never did provide documents or verbal words as to whether a variance exists. Deutsch was not in office for a follow up call on Friday. Council members Mohammed Akhtaruzzaman, 2nd Ward; Ruby Cotton, 4th Ward; Maritza Davila, at-large; Anthony Davis, 1st Ward; William McKoy, 3rd Ward; Alex Mendez, at-large; and Andre Sayegh voted in favor of transferring the licenses. Collazo said the council should have looked into the matter before approving the transfer. Davila and Davis made attempts to ask for information and whether the application was in proper order. Davis asked whether the seven-day advertisement notice requirement was met. Jane William-Warren, city clerk, responded that the requirement was met. Davis said he did not have any comments on Friday. On Friday, Mendez did not respond to phone calls to identify which documentations he was making reference to, for council members voted based on a resolution which did not include any attachments. Davila did not respond to a message seeking her comments for this story. When asked for comments on his vote Sayegh expressed his confidence in the clerk. Collazo said council members should have checked the documents before casting their votes. City’s law director Domenick Stampone said he will be willing to look into the matter if a city official asks him; he said so far no one has asked. Julio Tavarez, 5th Ward councilman, and Kenneth Morris, councilman at-large, were not present during the vote.